A medium priced iron with 80 watts of power. To maintain proper temperature, a temperature control unit is suggested. Comes with 3/8" and 1/4" iron tips. The Weller 100 watt iron is the first choice of professionals. Its patented temperature control unit is built in, eliminating the need for rheostat. The W100 quickly reaches the proper temperature and maintains it. Ideal for both lead and foil work. It's equipped with a 3/8" 700 degree tip. Choice Soldering Iron stand is well-balanced and has a heavy coiled wire cage designed to hold all major irons. Replacement tip for Weller 100W iron. 900 Degree 3/8 inch. Sizes available: 1/8" 3/16" 1/4" 3/8"
Replacement tip for the Weller 100W soldering iron. Sizes available: 1/8" 3/16" 1/4" 3/8"
This fume extractor removes flux fumes from the soldering workbench by drawing smoke through an activated carbon filter. With its exceptionally quiet fan, it can process up to 1.37 cubic meters of air per minute and its stand is adjustable allowing it to be set-up in multiple positions. 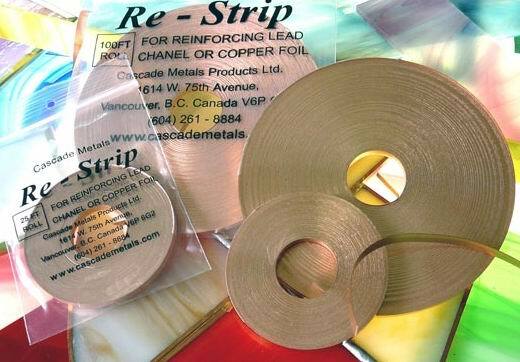 Re-Strip Copper Reinforcing 25 ft.
Re-strip is a strip - like a ribbon 5/32" wide - made from copper or brass. It is used to reinforce stained glass projects made with lead or copper foil. Choice Soldering Iron combines safety with an affordable price. - Suitable for all types of stained glass work.